There just seems to be more social activities over the summer. Perhaps you’re invited to a special occasion, such as a wedding. Or maybe you’re going to your high school reunion. But even if it’s only a day at the ballpark, your smile should say, “I’m happy to be here!” With a bright and white smile, that’s exactly what friends and family will hear. Read on to find out how teeth whitening at Los Fresnos Dental Center can help you show off your best smile. So why is it so difficult to keep your teeth white? Well, part of the reason is genetics. Our teeth are programmed to be varying shades of white with hints of gray, brown and yellow. These genetics tend to become more noticeable as people age. In addition to your DNA, the foods and beverages that pass through your mouth and over your teeth affect their color, too. Just think of all the colors: black coffee and tea, red raspberries, dark chocolate, orange carrots and the list goes on and on. If you’re a smoker—and we hope you’re not—then you know that tobacco can leave a deep stain on your teeth. There are also some medications that can discolor teeth, as well as the habit of teeth grinding. For the fastest teeth whitening, the dentists in Los Fresnos use a professional grade gel that is as effective as it is safe. After placing a shield over your gums and lips, one of our staff will apply the gel to your teeth and then activate and speed the whitening process with a special light. In just about an hour’s time, you’ll have a smile that might be up to 10 shades whiter than when you walked in to our office. We also offer take home teeth whitening for patients whose schedules simply are too packed to even allow for one more appointment. We’ll give you custom-sized mouth trays and professional-grade gel to use each night for one or two weeks. Just fill the trays with gel and wear them according to instructions from your cosmetic dentists in Los Fresnos. 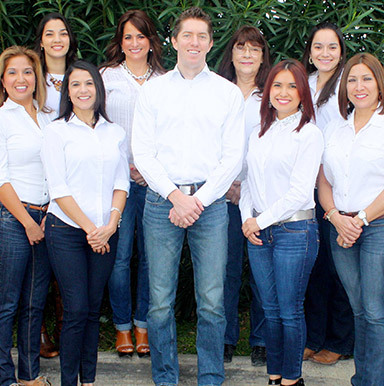 To ensure that your smile is ready for the fun of summer, contact Los Fresnos Dental Center for teeth whitening.